As the Saturday action came to a close it was very clear that this Sunday was going to be one of the busiest days at the World Series of Poker, as two tournaments will be awarding bracelets (the $5k Mix-Max and the $1,500 Omaha 8) Day 1b of the $1,500 NLHE tournament will get underway, and the $5k 7-Card-Stud event is also on today’s docket. In 2010 Joseph Cheong was one of the breakout stars as he took aggression to a whole new level on his way to finishing third in the World Series of Poker Main Event. Since then, the man known as “Subiime” has proven to be a very talented poker player, and is now on the cusp of winning his first WSOP bracelet. Another tournament that will declare a winner on Sunday is the $1,500 Omaha 8 event. With nearly 1,000 entrants the tournament will award a sizable first-place prize of $264k, not to mention the gold bracelet. Among the players still in contention are 2010 WSOP Main Event runner-up John Racener (who finished one spot ahead of Joe Cheong), Raymond Davis, and two players looking for their second WSOP wins in Allen Bari and Gavin Griffin. With nearly 1,700 entries on Day 1a, and a re-entry format, Event #9, a $1,500 NLHE tournament, could be one of the biggest fields of the 2012 WSOP. A number of big names finished the day strong, with several bracelet winners landing in the Top 10 chip counts, including 2011 double-bracelet winner Brian Rast and 2010 Main Event Champion Jonathan Duhamel. Along with Day 1b of the $1,500 NLHE event, the $5k Stud event will also begin on Sunday. Last year 126 players registered for this event which boasted a $10k buy-in, so we’ll have to see if the reduced buy-in is able to bring in more players. 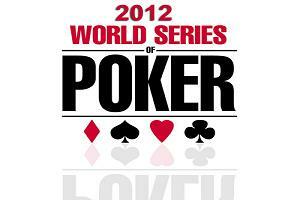 This entry was posted on Sunday, June 3rd, 2012 at 6:52 am and is filed under Poker News. You can follow any responses to this entry through the RSS 2.0 feed. You can leave a response, or trackback from your own site.